It's at the cutting edge of business communications, and at the forefront of every IT technician's mind. Video conferencing is the dream of every big business CEO, and a handy way for even small businesses to communicate with partners. For companies which maintain a customer service department, video conferencing is a great way to keep in touch with customers, giving them the impression that your company really cares, and removing the mask of a faceless big business hiding behind call centres and automated telephone menus. Many businesses have the understandable longing to break down the barriers between fellow business partners and customers alike, and to install a video conferencing system in their offices, but few know how to assess the requirements of such a step without hiring in a specialised company to get the job done. The truth is that the ICT department in any reasonably sized company is often more than capable of installing the hardware and software necessary to make your video conferencing endeavours a success, but they simply don't have the correct network configuration required to handle the huge volumes of traffic required. The guide below will help you assess whether your network bandwidth is sufficient for video conferencing, and to take the steps required to upgrade your existing hardware to meet the demanding requirements of this activity. How do I Measure Network Sufficiency? Packet Loss - video conference information is sent in 'packets', which are chunks of data transmitted individually. This situation is preferable to transmitting data as a constant stream, since a transient interruption in packeted transmissions, which would completely disrupt a continual data stream, does not necessarily lead to loss of picture when using the packet system. Acceptable rates of packet loss range from 0.1 to 2 per cent, otherwise picture loss and audio drop outs result. Jitter - the term 'jitter' refers to the variation in timing of the picture caused as packets are received, buffered, and distributed to the screen as the available bandwidth changes. 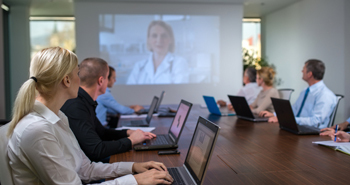 Most manufacturers recommend a jitter below 20 milliseconds for an uninterrupted video conference, and an increase in jitter caused by an underpowered network connection can cause 'skipping' or 'freezing' of a picture, resulting in noticeable disruptions. Latency - latency is caused by the difference in size of audio and video packets. Audio packets tend to be less than 400 bytes in size, while video packets can be up to 1500 bytes in size. Because of this, coupled with subtle differences in prioritisation of audio and video traffic, audio transmission may become out of sync with video transmission during the call. Latency values should typically be lower than 300 milliseconds so that the mis-synchronisation of the packets is not noticeable. Is my Network Connection Sufficient for Video Conferencing? For large companies, running a speed test utility for each computer which is to be added to a video conferencing network, as well as installing a network traffic monitoring utility to assess network usage during peak times, is the best way to assess available bandwidth for video conferencing. For small businesses where only a few computers are in use at any one time, many video conference packages recommend a minimum broadband speed of 1-2 Mbps for smooth video calls. Is my Network Hardware Sufficient for Video conferencing? Sometimes your network connection bandwidth is more than sufficient for video conferencing, but the hardware in the office cripples internet speed. Routers accessed by multiple computers can be a real bottleneck for internet speeds, so connecting your video conferencing suite to the internet via Ethernet cable is usually the best way to achieve the highest speeds. Upgrading your hardware will ensure that your computers are running at optimum speed for video conferencing at all times. How can I Upgrade my Network Connection? Purchasing a faster connection speed from your Internet Service Provider is likely the simplest solution to ensuring that your office is video conferencing ready, but some simple investments, like replacing wireless routers with Ethernet cables and installing software to reserve bandwidth specifically for video calling, will likely provide the biggest increase in video quality for the least expense. Video conferencing will indeed save your company money in the long-run by reducing the money spent on travel and hosting representatives from other firms. While the initial cost of the network upgrade often required to facilitate a video conference suite may seem prohibitive, your company will reap the rewards in terms of the vastly reduced travel expenses that result from these upgrades, and the image of a 'green' company who slashes air miles in favour of new, cutting edge green technology. More about video conferencing can be found here and here.